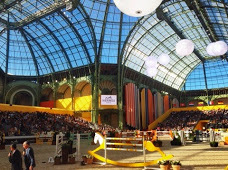 All horses and riding lovers have heard about it : this past weekend (14-15-16 March), the Grand Palais in Paris hosted for the 5th time the now famous Saut Hermès (Hermès Jumping Grand Prix). Even for all those who do not belong to the world of riding, it is a magical experience and a beautiful event to attend. 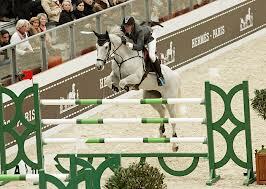 WHAT IS THE SAUT HERMES ? 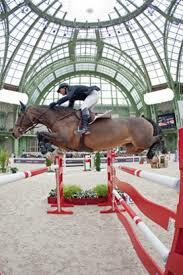 The story of Hermès is closely linked to horses. In 1837, Thierry Hermès (yes, it is originally a family name, nothing to do with the roman god) opened a factory specialised on saddles and riding equipment. Horses were indeed the main way of transportation in those days, this industry was therefore flourishing and thanks to a prize won at the Universal Exhibition in 1867, Hermès gained an image of luxury and quickly attracted wealthy and famous customers. After the 80’s, under the supervision of Thierry’s successors, the brand develops its production towards other leather goods, first big bags tailored for horsemen, and later travel bags adapted to the new mean of transportation : the car, and even later clothing and perfumes. But horses and riders remained central in Hermès production and history (just have a look on most of the designs of the “carrés” and other scarves), and that is why the famous brand launched its own competition five years ago, now a well known rendezvous in the world of ridding. 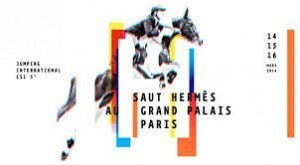 More information about the competition itself and the results on the official page of the Saut Hermès here. The world-famous bag Kelly by Hermès is in fact a derivative of the “Tall Bag with Straps” launched in 1882, that was made for horsemen to transport their riding boots and their saddle. In 1935, Hermès launched a smaller version for women. The actress Grace Kelly discovered it in 1954 and immediately fell in love with it while working with the costume designer on accessories to be used in Hitchcock’s movie, To Catch a Thief. The princess-to-be began a collection of this bag, and when she was photographed in 1956 holding the bag in front of her belly to hide her not-yet-official pregnancy, the success became craziness. Women began to ask for the “Kelly bag”… the success was such that Hermès decided to rename the bag after the princess name ! 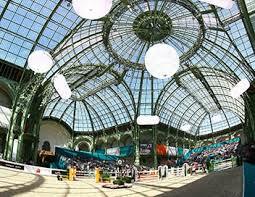 AND WHAT ABOUT THE GRAND PALAIS ? 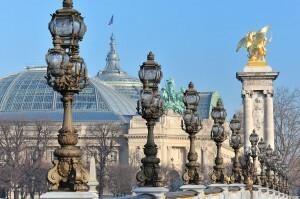 The Grand Palais was built for the Universal Exhibition hold in Paris in 1900. To enter the new century, the idea was to surpass in boldness what had been realised for the previous exhibition in 1889 (including the Eiffel Tower !). A competition was launched to gather ideas, and the accepted project suggested to link the Champs-Elysées with the Invalids by opening a new avenue and building a bridge (Alexandre III bridge) over the Seine. Some candidates proposed to build two palaces for fine arts along the new avenue : the Grand Palais and the Petit Palais, facing each other.